"The other item [...] is the mirror. Five examples are known from Eastern Yorkshire [...] All five are made of iron. [...] All of the mirrors [...] pre-date the majority of the magnificently decorated bronze examples known from elsewhere in the British Isles, being made some time between the late 4th and late 2nd/early 1st centuries BC. [...] inhumations are exclusively female [...] This association with women has often led to the dismissal of these items as mere accoutrements or 'attractive vanities' of high status females. In both popular accounts and illustrations, they are depicted as a means of beautification or self-admiration. Yet [...] the mirror might have been part of a broader repertoire of objects designed to prepare and present the body during a period of changing concepts of personhood. As 'equivalents' for the weapons which were interred with men in the chariot burials, they may also have had a more powerful role. Ethnographic parallels suggest that in small-scale societies, mirrors are used as implements for divination, contact with ancestors and spirits, as well as insights into the past. Their shine, brilliance or luminescence is often seen as a manifestation of spiritual essence or sacred potency, through which a shimmering vision world is experienced by the diviner. The iron plate may never have accurately reflected the face held up for scrutiny, but it is possible that its shadowy, broad features were seen by the viewer as an indication of some presence 'beyond' the plate. Mirrors are held in awe, as objects of intrinsic power, but to be wielded effectively, they must be allied with a skilled seer or ritual specialist capable of interpreting what is seen. 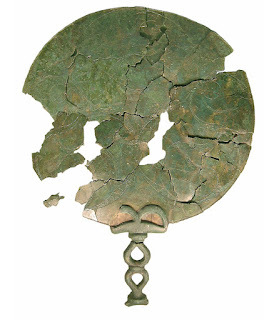 The implication of such analogies is that Iron Age mirrors were not only symbols of wealth, made of significant quantities of iron, wrought and polished by skilled craftspeople. They may have been seen as awesome, intimidating artefacts – weapons of a kind – which enabled particular women to wield both aesthetic power and perhaps spiritual authority, in life and death. Iron mirrors certainly made demands upon their users, requiring particular care to avoid tarnish from grease and rust, as well as polishing on a regular basis [...] there were traces of mineralised wood adhering to the Garton Slack mirror plate, which might suggest it had been placed in a casket. [...] In mirror burials and finds from the late Iron Age [...] there is often a parallel treatment of human body and artefact. It is possible that like its human counterpart, these mirrors had been placed in a 'coffin' like box [...] dressed or 'wrapped' with decorative textiles. 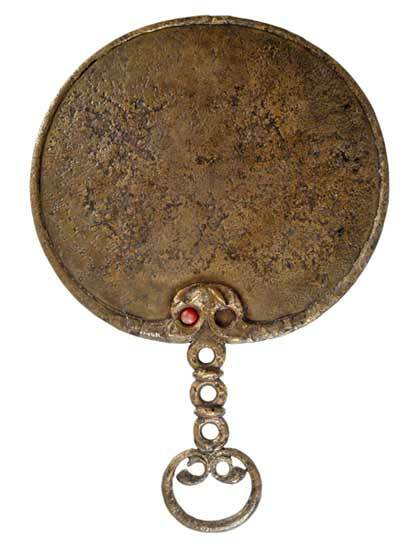 The Wetwang Village mirror may have been interred with the equivalent of a shroud, brooch and miniature necklace. Mirrors may thus have been of the special objects which were perceived as having an identity and biography of their own." 1. If you point this mirror at a dead body its reflection appears alive and is able to communicate. The reflection has all the knowledge the deceased person had right before the moment of death. Its eagerness to answer and cooperate depends on questions asked, relationship to the seer (if any) and seer's power and experience. 3. As above, but reflects the future. 4. If you point a mirror at a person its reflection must answer any questions of the seer, and answer truthfully. It may however use half-truths, omissions and manipulations if the seer isn't experienced enough. 5. Any person reflected in the mirror disappears and is trapped in the mirror itself. Can only be freed by trapping another person. 6. This one works similarly to the one above but with one major difference – the trapped person doesn't disappear but is replaced by its reverse-twin. The reverse-twin is a polar opposite of the original both in terms of personality and abilities. The original gets trapped in the mirror. Can only be freed by killing the reverse-twin. 7. Any text reflected by the mirror can be read by the seer as if a comprehend languages/read magic spell was cast. 8. Freezes reflected victim(s) in time. As long as the mirror is able to reflect someone, that someone is frozen in time. That one's pretty powerful so I would give the victim(s) the chance to avert eyes and other such tactics like if they were subject to petrifying gaze. Also – obstructing the view, causing darkness, destroying the mirror etc. frees the victim(s). And if you're out of ideas or can't decide you can roll what his profession was here.